Aspyr Media on Monday announced that Duke Nukem Forever, the long-awaited video game sequel released on various platforms earlier this month, will come to the Mac in August. In a written statement, Aspyr Media president Michael Rogers said, “We think Mac gamers will love taking a bite of Duke’s special pain cake.” Aspyr is publishing the game in partnership with developer 2K Games. 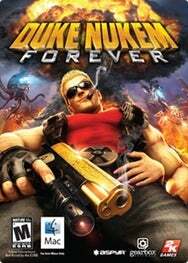 Duke Nukem Forever’s development first began in 1996, with various press releases and marketing materials promising its release in 1997 and 1998. In 2001, then-developer 3D Realms announced that the game would be released whenever they finished. Eight years later, 3D Realms had let go its development team and the game was transferred to Gearbox Software. In September 2010, the game was scheduled for a May 2011 release; that later slipped to June of this year. You’ll be forgiven, then, if you’re mildly skeptical that the game will indeed arrive on the Mac before the leaves start falling. That may not be such a bad thing. The PlayStation 3, Xbox 360, and PC versions of the game haven’t scored particularly well with reviewers. The game has various been criticized as buggy, outdated, and offensive. In fact, the game’s former public relations representative—The Redner Group—was quickly canned after tweeting that it wouldn’t send review copies of other games to press outlets that criticized Duke Nukem Forever harshly. The game is available for pre-order now for $45; the official price will jump to $50 after Duke Nukem Forever’s release. It will require an Intel Core 2 Duo 2.4 GHz Mac or better running Mac OS X 10.6.7 or later, along with 2GB of RAM.